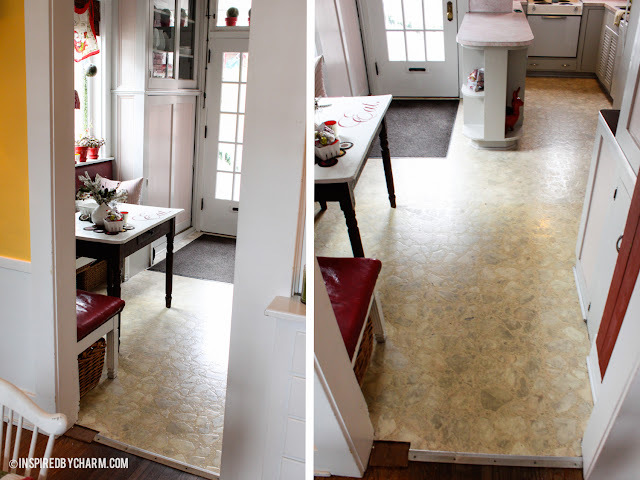 Over the past four years I’ve managed to cleverly hide my kitchen floor from view on this blog. Have you noticed? When I bought my house in 2008, the floor was pretty bad. Almost five years later, it looked even worse. I’m not sure why someone would pick that pattern or color, but to each his own. After years of saving, I was finally able to get some new flooring. Yikes, right? Do you see why I’ve been hiding it from you for so long? Yes, we all have our dirty little secrets. I mentioned back in early December that the folks came to install it. Well, the wrong tile was sent and one thing lead to another. After the delay, the tile was finally installed this past week. I was so thankful that I had decided to bring in the professionals. I wasn’t even DIYing it and it was a hot mess. 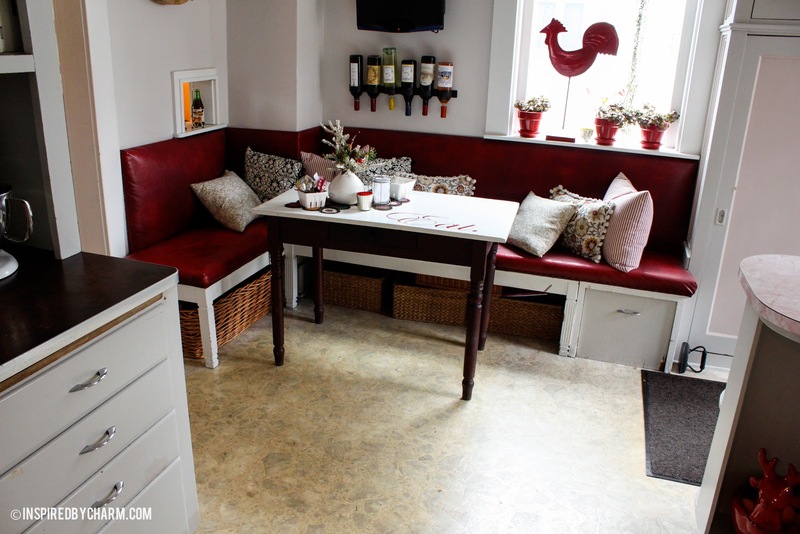 Before the new flooring arrived, I had to get rid of my cute, little built-in seating. Terrible, I know. But to be honest, as much as I enjoyed it, it had to go. Sections of the seat were torn, and the back of the banquette actually blocked about one third of the window. Weird, right? You can’t tell from the picture, but it was always something that bothered me. I love natural light, so the more, the better. I still have to take pictures of the new floor, so I’ll be back with those pictures next week. The kitchen isn’t quite back in shape either, due to various reasonswhich I’ll explain then. Nevertheless, I’m making progress and I’m completely smitten with the new floor. Stay tuned! This post first appeared on Inspired by Charm on 1/10/2013. All text, photographs, and graphics were created by Lifestyle Blogger Michael Wurm, Jr. unless stated otherwise. Ah! This post was a total tease! 🙂 I can’t wait to see the new floor. Yes, a TOTAL tease…Guess I should have read the ENTIRE title though. It did say “BEFORE”. I can’t wait to see the new kitchen! ahh can’t wait to see the reveal! we are in need of new floors in several of our rooms too and i can’t wait. Can’t wait to see the reveal. I know how it feels to have flooring that looks horrible. I have a hardwood floor that needs to be done over. I’m patiently waiting for funds to do the floors over. What in the world will you do with all those pillows now? lol. Thanks for sharing. Where would one go to purchase a floor like that today? I had a similar version in my house…but it was green. That’s very exciting! It will seem like a brand new room when it’s all put back together. 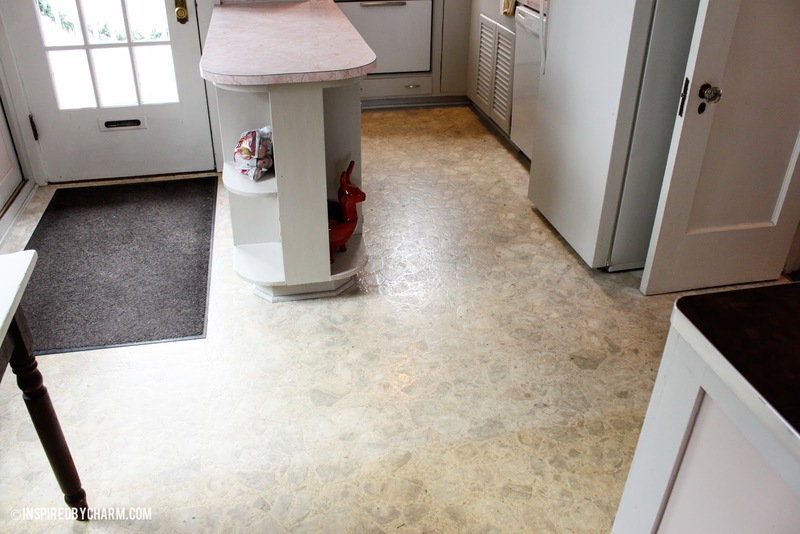 Your old flooring reminds me a bit of the countertops in my house…mine are 1970’s woodgrain and are quite Brady-esque. What on earth were they thinking?? OMGosh…I have that exact flooring except mine is urine yellow. Try not to be hating…lol. I call it my pee pee floor! Ugghh . Can’t wait to see your new flooring! I’ll bookmark your blog and check again here regularly. I’m quite certain I’ll learn a lot of new stuff right here! Best of luck for the next! Michael, it looks like that floor would hide muddy dog tracks and a few other sins! LOL I’m sorry that you’re losing your banquette, but totally agree with you not to block any part of a window!! Bless your heart, you deserve a new floor!! for the reaѕon that і wish for enjoyment, sincе thіѕ thіs web sіte conationѕ truly good funny data too. Can’t wait to see your new flooring! I know it will be amazing! 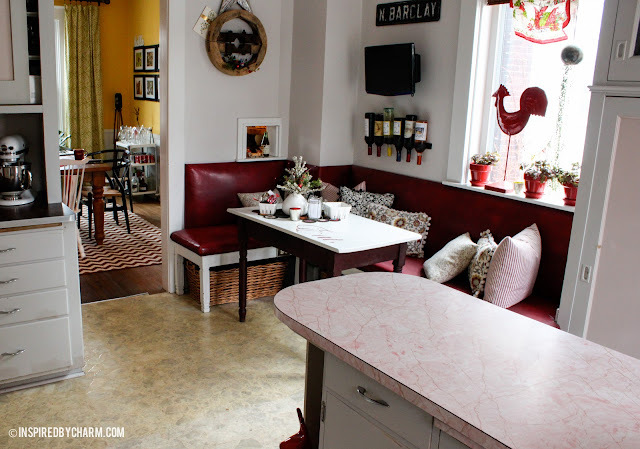 Love the banquette and am so sad to see it go….but I know you have something even more incredible! Have a great weekend rock star! 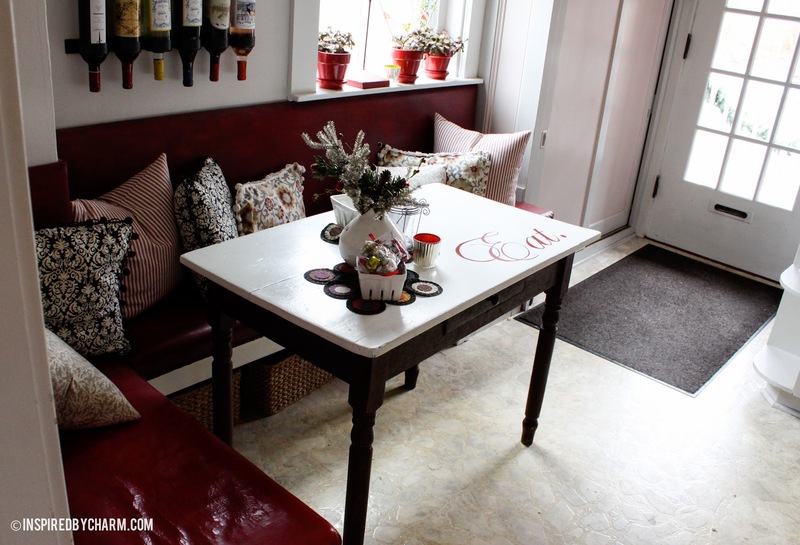 I love what you’ve done with the wine bottles! And I can’t wait to see the reveal! I can’t wait to see how the new floor looks. We had an awful kitchen floor, too. It was ceramic tiles and some of them were cracked. We used a laminate, which is easy to clean and maintain.